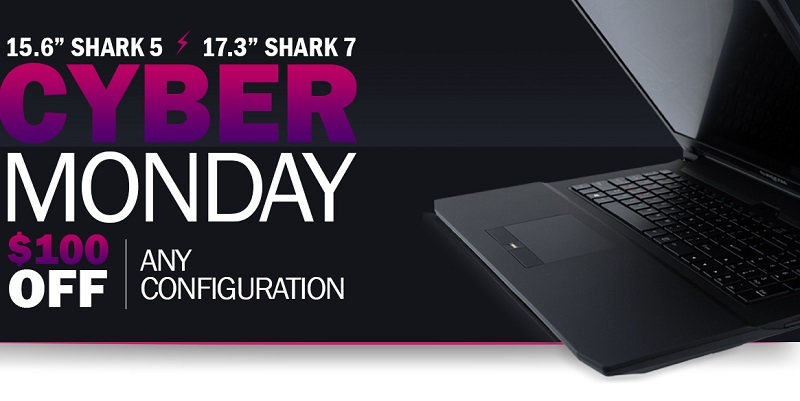 The deals keep coming at Eurocom with Cyber Monday sales on the 15.6” Shark 5 and 17.3” Shark 7 ultraportable laptops. Find the Cyber Monday Super Sales here! The Skylake based Shark 5 and Shark 7 are slim, lightweight, sleek and powerful, with on board GPU and CPU for maximum battery life and an internal Ultra Slim Optical Drive. Graphics performance comes from a NVIDIA GeForce GTX 960M with 2 GB GDDR5 memory and Intel HD Graphics 530. The GPUs are switchable between iGPU and dGPU using Microsoft Hybrid Graphics to give customers great performance and outstanding battery life. The Sharks have Intel HM170 Express Chipsets running the Intel Core i7 6700HQ processor with 4 cores, 8 threads running at 2.6 GHz up to 3.5 GHz, with integrated Intel® HD Graphics 530. Due to Hyper-Threading, the four cores can handle up to eight threads in parallel leading to better overall utilization of the CPU. The i7-6700HQ is rated at a TDP of 45 W including graphics card and memory controller. The high levels of security in the Sharks are brought on by the TPM 2.0 can save organizations and individuals in IT management costs. The EUROCOM Shark 5 is prewired for LTE or 3G/4G/UMTS/HSPA card module support, through an M.2 slot, so users can have a reliable internet connection on the go. Both the Shark 5 and Shark 7 have support for an upgradeable optical drive that can be customized to be a DVD drive, Blu-Ray drive or an additional storage drive bay. User upgradeability and user configurability are core tenets of all Eurocom systems; the Shark is no different with upgradeable memory, storage, wireless card and keyboard. They both support two memory modules for up to 32 GB of DDR3-1600 memory and one M.2 SSD SATA PCIe Gen2 x2/x4 and two 9.5 mm HDD/SSD SATA for up to 4.5TB of storage.